Book Riot’s free-flowing celebration of the book in New York earlier this month featured Margaret Atwood and drew literati from the tri-state region. 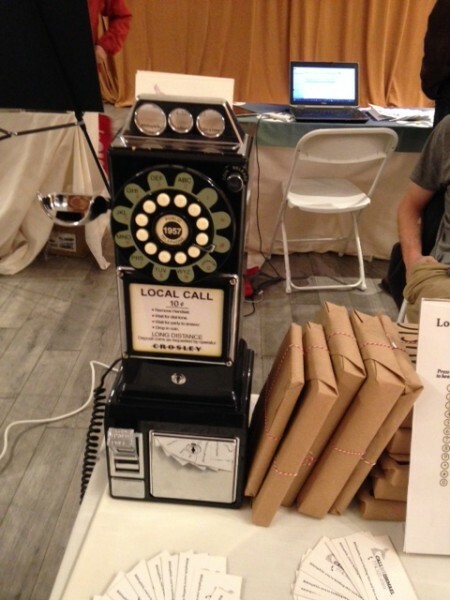 Another vendor, Call Me Ishmael, was there fresh off of their Kickstarter campaign. The group has created groovy old-school looking phones that contain pre-recorded messages of strangers musing about their favorite books. I selected a review of Dr. Seuss’s The Sneetch, which ended up being a 4-minute reflection of a Boomer remembering what it was like to grow up during segregation, and how Dr. Seuss inspired wider thoughts around that. Ten of their phones were purchased from the Kickstarter and will be rolled out in bookstores and public libraries in the next few months. The literary social change activist group The Harry Potter Alliance was also a presence, and its members wore their special green “Wizard Activist” name tags below their Book Riot entry passes. Everyone there was reading! In line, quiet people held their books up to their nose, waiting for them to be signed. There was a reading lounge where more quiet people sat on puffy beanbag-style chairs and read. All in all it was a great event, a very well orchestrated Riot, indeed.